Sound symbolism, a perceived resemblance between the sound of words and their meaning, is a salient property of ideophones in many languages. On the whole, however, it is safer to see ideophones and similar sounds as proof of their users’ sensitive feeling for language, a deep sensitive attachment to sounds and their power of vivid suggestion or representation. In many cases, a speaker or oral artist can avoid an ideophone by simply duplicating a word of action: for jegidezie tiii, for instance, the narrator could have said jegide jegide, which would translate into something like ‘walked on and on.’ But tiii has a special appeal both as a sound and as a more dramatic way of capturing the idea of extent. Okpewho’s remarks highlight the importance of the material properties of the ideophonic word. It is not a simple case of having words for things that some other languages may not have lexicalized words for; it is the nature of the ideophonic word —the fact that meaning is suggested by the material properties of the sign— that makes it such a significant linguistic device. What Okpewho calls ‘vivid suggestion’ I have tried to capture with the phrase ‘vivid depiction’ in my working definition of ideophones. Okpewho, Isidore. 1992. African Oral Literature: Backgrounds, Character, and Continuity. Bloomington: Indiana University Press. Up next week: the Seventh Biennial Symposium on Iconicity in Language and Literature (programme here), at Victoria College, University of Toronto, June 9-14, 2009. It looks like an interesting bunch of linguists and literary theorists. I will give a talk on Tuesday the 9th, the abstract for which can be found below. The similarity between ideophonic and poetic language is easy to see (cf. Nuckolls 2006). Yet the shadow of Lévy-Bruhl, who assigned mimesis in language to the realm of primitivity, has loomed large over linguistics and literary theory alike. The poet Ezra Pound, a central figure of Modernism, is a case in point: while his fascination with Chinese writing spawned the ideogrammic method, the mimicry and gestures of the ‘primitive languages in Africa’ would never become more than a mere curiosity (ABC of Reading, 21). This talk imagines Pound transposed into the culture of the Mawu. What would have struck him about their ways of ‘charging language’ with imagery? I will show that there are three levels of iconicity in Siwu ideophones —direct, relative, and Gestalt iconicity— which are combined in various ways to vividly recreate sensory events in sound. The abundant use of ideophones across a wide range of discourse genres suggests a concern of Siwu speakers with their perceptions. These observations will be juxtaposed with Pound’s views on the ‘word of literary art which presents, defines, suggests the visual image’ (Selected Prose, 321), and his perpetual interest in the exact qualities of perceptions. The goal of this contrastive analysis is to shed light on the linguistic and cultural ecology of an everyday poetic device in the world’s languages, and in so doing to rehabilitate what one might call ‘the ideophonic method’. Fortune, G. 1962. Ideophones in Shona: An Inaugural Lecture Given in the University College of Rhodesia and Nyasaland on 28 April 1961. Oxford University Press. Lévy-Bruhl, Lucien. 1910. Les Fonctions Mentales dans les Sociétés Inférieures. Paris. Nuckolls, Janis B. 2006. The Neglected Poetics of Ideophony. In Language, Culture, and the Individual, ed. Catherine O’Neil, Mary Scoggin, and Kevin Tuite, 39-50. München: Lincom Europa. Pound, Ezra. 1914. Vorticism. Fortnightly Review 96, no. 573: 461-471. ———. 1934. ABC of Reading. London: Routledge. ———. 1973. Selected Prose. New York: New Directions. Voeltz, F. K. Erhard, and Christa Kilian-Hatz, eds. 2001. Ideophones. Typological Studies in Language, 44. Amsterdam: John Benjamins. Ideophonic vocabulary often displays some degree of sound symbolism; i.e. perceived likeness between form and meaning such that words with similar meanings resemble each other phonetically. Languages differ in their means of attaining such form-meaning mapping and these correlations can develop freely in spontaneous speech. This talk examines one such pattern, that of stem alternation. The language of focus is Semai (Austroasiatic, Mon-Khmer), spoken by an Aslian community on Peninsular Malaysia. Semai ideophones convey speakers´ perceptual experiences in semantically detailed ways, often withmultiple aspects of an experience encoded in one word. Data show that through different types of stem alternation, speakers express fine-grained semantic differences between different sensory events. This structural tool is used to switch between sensory modalities or convey differences in the internal structure of a specific sensory event. In addition, some types of alternations are used more productively than others in spontaneous speech, suggesting a continuum of conventionality in the linguistic encoding of perception. Many African, Asian and American languages have a class of words called ideophones: marked words that vividly evoke sensations and perceptions. Hitherto, research on ideophony has focused almost exclusively on the form of ideophones to the neglect of their function. This talk will look at ideophones in actual usage in Siwu, a Kwa language of eastern Ghana. It will be shown that ideophones occur across a wide variety of speech genres, including conversations, arguments, insults, narratives, greeting routines, and special genres like riddles, recreational dances, and funeral dirges. A closer look at data from about 60 minutes of spontaneous conversations will elucidate the different uses to which ideophones are put by both speakers and recipients in tellings and turn-by-turn talk. Some specific genres, including funeral dirges and recreational dances, will be compared to show how the use of ideophones may be constrained by genre. Just a quick follow-up on my earlier post. Foroni & Semin (in press, Psychological Science) do what I hoped somebody did: examining the bodily grounding of non-ideophonic vocabulary related to emotional states. Theirs is not an imaging study like Osaka & Osaka 2005, but a study of motor resonance in facial muscles. The terms tested are action verbs (to smile; to frown) and adjectives for the corresponding emotional states (without overt facial configurational semantics), e.g. ‘happy; angry’. Very briefly, the results indicate that both types of words induce motor resonance in facial muscles, though the action verbs do so more strongly than the adjectives. The authors note the striking similarity of the results to earlier experiments involving visual stimuli (pictures of facial expressions, Ekman style; e.g. Dimberg & Petterson 2000). An interesting second experiment shows that the motor resonance even exerts influence on judgements of the funniness of cartoons: subjects subliminally primed with the verb ‘smile’ tend to rate cartoons as funnier than subjects subliminally primed with the verb ‘frown’. If facial muscle activity is inhibited by having participants holding a pen between their lips, the effect is not significant; neither is it significant in the case of adjectives like happy and angry. There is some wiggle room still for ideophones. As Foroni and Semin say, ‘Not all linguistic expressions have the same consequences. Certain categories (i.e. verbs) induce motor resonance more than others and contribute differentially to the shape of our judgments.’ My hypothesis would be that ideophones for emotional states and facial configurations would rival verbs in the extent to which they cause motor resonance. Osaka & Osaka’s (2005) results are inconclusive in this regard, because they did not include non-ideophonic action verbs or other words in their comparison. Dimberg, Ulf, and Maria Petterson. 2000. Facial Reactions to Happy and Angry Facial Expressions: Evidence for Right Hemisphere Dominance. Psychophysiology 37, no. 05: 693-696. Foroni, Francesco, & Semin, Gün R. (2009). Language that puts you in touch with your bodily feelings: The Multimodal Responsiveness of Affective Expressions. Psychological Science. Osaka, Naoyuki, and Mariko Osaka. 2005. Striatal reward areas activated by implicit laughter induced by mimic words in humans: a functional magnetic resonance imaging study. Neuroreport 16, no. 15 (October 17): 1621-1624. A 2005 study suggests that Japanese ideophones of laughter activate striatal reward centers in the brain, but I think the results should be treated with a pinch of salt. Speaking of salt, Japanese gargle with salt water regularly as a prevention against the common cold; they even have an ideophone for it (but so do we, don’t we?). That’s giggles and gargles today. Let’s tackle the giggles first. Since ideophones have been claimed to somehow establish a more direct link between sounds and sensations than other words, brain imaging of ideophone production and comprehension is an exciting research area. Basically, the finding of Osaka & Osaka is that Japanese ideophones for laughter activate striatal reward areas, just like real laughter and other pleasurable activities do. The ideophones used are ‘ghera-ghera’ (strong laughter), ‘nikoh-nikoh’ (strong), ‘kusu-kusu’ (medium), ‘niyah-niyah’ (medium), ‘herahherah’ (weak) and ‘nitah-nitah’ (weak) (p. 1622, romanization by the authors). That is an interesting result, but I wonder: does the effect really occur because the words are ideophones, evoking the experience of laughter through their sound-symbolic form and imagistic meaning? Or could it simply be due to the fact that the words have to do with laughter? We can’t tell, because the baseline comparison is not with non-ideophonic real words but with nonsense words (called ‘nonsense phonemes’ by the authors). Since non-ideophonic laughter-related words have been kept out of the comparison, we cannot be sure that ideophony (onomatopoeia/mimesis) is causing the effect, although this is what the authors would like to claim. There is some reason to think that embodied semantics might be enough to induce such effects; think for example of the brain imaging studies showing that certain sensori-motor cortex areas not only upon tactile stimulation of the body part in question (e.g. the hand), but also during the processing of body part terms and verbs implying them (e.g. hand, grasp; Rohrer 2001). So the question is: would the effect found by Osaka & Osaka also occur with non-ideophonic laughter-related words in Japanese? For comparison, it would also be good to have a not so heavily ideophonic language thrown in. Would the English verbs ‘giggle’ and ‘laugh’ also trigger the effect? Sound-symbolic ‘giggle’ moreso than ‘laughter’? Then things start to be really interesting. A related problem is the claim that ‘image formation of onomatopoeic words’ plays a role in the effect. Once again this would be an interesting claim to test; native speakers of ideophonic languages often report that ideophones evoke vivid images. But in this study it remains an untested background assumption. The way the experiment is set up doesn’t seem to allow for any inferences about it. For all we know the effect might just be due to an association between the sound and the experience of laughter; it is not at all obvious why image formation would come in. One way to approach this issue would be to do imaging studies of ideophones that don’t imitate sounds, but other sensory events. So much for the giggles. What about the gargles? The gorgeous gargling girl above is one of the stimuli used by Prof. Mutsumi Imai in a study of child-directed speech in Japanese. One of her findings is that when describing scenes like this to their child, mothers will tend to use more mimetics (ideophones) than when they are describing the same scene to an adult. I’m planning to do a pilot in Kawu using prof. Imai’s stimuli, and one question is to what extent the original material would be usable in a West-African context. The idea is that the stimuli can be described using ideophones. Since most of the illustrations are simple events (jumping down, jumping across, throwing, rolling sth. up) I think they should be usable by and large. Perhaps the skin color will have to be changed — I prefer stimuli to be as culturally inconspicuous as possible — though the question is whether that really would affect what we’re after. However, the one stimulus that I think won’t be familiar is the gargling one above. In the Japanese context, it is meant to elicit the ideophone garagara, probably in the light verb construction X suru ‘do X’. But in Kawu, the scene isn’t very recognizable. People usually drink from calebashes (or their hands), though whites are known to prefer cups — so my guess is that the girl would simply be seen as drinking. Since gargling is not a culturally salient event in Mawu society, I don’t think people would readily think of it, even if there happens to be an ideophonic word for it. The Japanese ideophone for gargling is garagara. 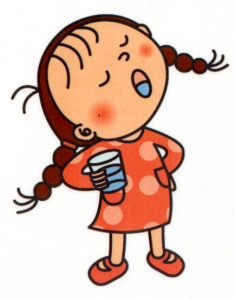 Interestingly, Kimi Akita tells me that “Japanese mothers tell their kids to pronounce “garagara” while gargling. This is because the articulation (especially, that of the velar consonant) of the mimetic is believed to help kids gargle successfully.” Now that’s an interesting intermingling of habitus and embodied meaning. I tried this (without any appreciable gargling experience) and nearly choked. This gives a whole new meaning to the phrase “Embodied semantics is a killer idea”! Imai, Mutsumi, Sotaro Kita, Miho Nagumo, and Hiroyuki Okada. 2008. Sound symbolism facilitates early verb learning. Cognition 109, no. 1 (October): 54-65. doi:10.1016/j.cognition.2008.07.015. Rohrer, Tim. 2001. Understanding through the body: fMRI and ERP investigations into the neurophysiology of cognitive semantics. Talk presented at the 2001 International Cognitive Linguistics Association, Santa Barbara: University of California. Akita, Kimi. 2009-02. A Bibliography of Sound-Symbolic Phenomena in Japanese. Electronic ms, Kobe University. Akita, Kimi. 2009-02. A Bibliography of Sound-Symbolic Phenomena in Other Languages. Electronic ms, Kobe University. Time flies vuuu. About one month ago, The Ideophone has silently celebrated its first birthday kananana. English interspersed with ideophones looks childishly weird susuusu and chaotic basabasa,1 and that is precisely tutuutu one of the issues I’ve been trying to address here: what is the nature of ideophony, and how is it connected to language ecologies and ideologies?